Airlines who lease gates at airports usually offer the same amenities to all airlines/tenants: baggage facilities, concessions, and the like, which means that gate-lease fees vary little. If there is competition for amenities and fees, it is among airports. For example, Providence and Manchester offered lower fees and attracted discounters like Southwest unwilling to pay the higher fees of Boston’s center-city Logan Airport. The same applies for Miami versus Fort Lauderdale, Orlando International versus Orlando Sanford, and several others. There has been until now little competition within U.S. airports for fees and amenities. Austin-Bergstrom International Airport in Texas is now attempting to pull this off. Its only passenger terminal, the Barbara Jordan Terminal, is fully occupied and leased. So, to add significant service, it will need to build more space. But this new space is intended to serve the super-discount airlines like Skybus and Mexico’s vivaAeroBus that Austin wants to attract. Back in June, it began negotiations with GE Commercial Airline Services (GECAS) to build and operate a no-frills terminal at Bergstrom. GECAS would operate the terminal for thirty years, and it would be expressly designed for super-cheap airlines, with neither luggage facilities nor assigned gates. Gate fees at the GECAS terminal would presumably be much less than those at the Jordan terminal. “[e]ssentially, this new terminal will allow carriers to ompete against existing carriers at a substantial cost advantage. . . . While it may be argued that GECAS or some other third party is sponsoring the terminal development and not the City, this argument is splitting hairs. The end result allows the City to take actions which provide facilities to some carriers at a substantially reduced cost compared to those bound by agreement to more expensive facilities. The airport replied that the move simply makes more low-fare competition possible, adding that Southwest would not want to use the GECAS terminal anyway, so why not let an airline that does want to offer true no-frills service use it? Such an arrangement is hardly unusual. At New York’s JFK airport, the terminals are mostly built and run the airlines that use them. Pan Am’s Worldport (now used exclusively by Delta and its partners) and TWA’s Saarinen-designed Flight Center (now the under-construction JetBlue terminal) are both iconic examples of privately built terminals at public airports. American Airlines built its own new terminal there (T9), and Terminal 4, the main international gateway, is operated and part-owned by the same Dutch government company that owns and operates Amsterdam’s Schiphol Airport. There should be no problem with an airport leasing space to private operators. So then, what’s wrong with airport entrepreneurship? It’s complicated because airports are almost always publicly owned and operated. Airports must operate as public accommodations, open to all entrants. And is it fair for an city and airport authority to operate its own terminal (Jordan) and lease space for a private terminal operator (GECAS)? I don’t see why not. It happens all the time with leases to fixed-base operators and general aviation services. If Southwest is concerned that the GECAS terminal airlines at Bergstrom will enjoy an unfair advantage, it should seek to build its own terminal at the airport–or simply leave the market altogether, as their letter subtly hints at. Southwest signed the long-term gate lease freely, so it should not complain when another airline gets a different (better) deal under different circumstances. Southwest has brilliantly hedged its fuel costs, taking risks that that price of fuel might drop but betting that it wouldn’t. Its lease at Bergstrom should be considered in the same light. And if Southwest were to, against all odds, desire to build a terminal of its own at Bergstrom, the airport should negotiate with Southwest on the same terms as any other potential tenant. Overall, I think it’s good that airports seek ways to generate revenue, attract more flights, and cut costs–all of which can be done by privatizing various components of the airport’s business. More power to Bergstrom and GECAS. 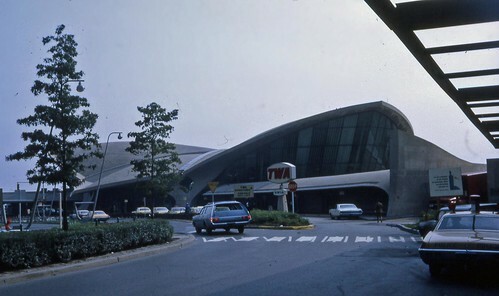 Image: JFK’s TWA Flight Center, back in the day. Image credit: Flickr user PhillipC. Used through a Creative Commons license. There are some subtleties I think you’re missing. The airport authorities are only able to build a terminal because the airlines have signed a long-term agreement to occupy what is built. Generally these use agreements run 30 years, but without them, no bond sales, no building, no airport, no air service. Same for the air side, with landing fees financing the runways and aprons. In return, the airlines get to sit on an “airport committee” that is sorta the board of the airport’s operations side. This is the group that sets landing fees and determines rents for the coming year. “Privately built” terminals usually have a huge amount of common money in them — United’s terminal in Chicago at O’Hare, for example, includes a lot of “public space” occupied by concessioners and including the walkways down the terminal concourses. Those public areas are not rented by the airline; the entire building becomes the property of the airport authority as soon as it’s opened. So, when the airport authority proposes to let some other airline, not a signatory to the use agreement, use the facilities that are paid for with bonds backed by the good faith of the airlines already there, the current guys get a little buggy sometimes. It sounds like the Austin people are trying to sneak around the airport committee and the use agreement. Sorta smells like a breach of contract to me. Is there more going on there? I don’t know the terms of the leases that airlines have at Bergstrom, but this doesn’t strike me as a legal matter like breach of contract. If Southwest (or other airlines) had legal footing, it would be in a much stronger position. Instead, its letter speaks of how a separate terminal would provide airlines using it with “a substantial cost advantage”–just as Southwest sought to do in Seattle. Furthermore, the issue is not airlines using space within the terminal but a private party leasing airport grounds. The airport is city property, so as long as the grounds are made available without discrimination to high bidders. It’s not an intra-terminal issue. I do wonder about the propriety of the city operating the Jordan terminal and leasing space for another terminal, but I would have to look over the lease agreements before I could consider it a breach of contracts with existing airlines. I am doing a project on the airline industry. Does anyone know how much a gate lease cost?